The Left can take their sanctimonious, politically correct, hypocritical horseflop about militaristic language being applied to politics and they can turn it sideways and shove it straight up their candy asses. 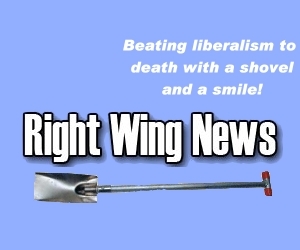 Here at Right Wing News, where our slogan is “Kneecapping Barack Obama at every opportunity,” not only are we targeting liberal politicians for defeat, we want to beat liberalism to death with a shovel. Like our President said, when the other side pulls out a knife, our side should pull out a gun — rhetorically, of course. We’re engaged in political warfare for the soul of this country, we make no apologies for it, and we’re not going to curb how we talk about it because liberals are having so much fun exploiting a tragic event. Of course, political violence aimed at other Americans is unacceptable. No one on this website is going to urge you to physically harm someone on the other side of our political debate. But, we do want to kick their asses politically. We’re locked, we’re loaded, and we’re ready for political combat. If that’s too tough for you, then step out of the crossfire and quit, you wussy. All this nonsense is pure political theater anyway. Show me a liberal who complained when his side compared conservatives to Nazis or claimed that Bush was behind 9/11. In other words, liberals talk about meaningless words like “targeting” and “warfare” in order to distract people from the fact that leftists regularly say things, that, if they really believed what they were saying, would lead to violence. In any case, kooks like Jared Lee Loughner have always been around and they always will. Trying to truly understand their motives isn’t possible because they’re not sane and they don’t think in a straight line like normal people do. Trying to not to use such warlike imagery when we talk about politicians probably isn’t going to influence these people at all and even if it was, are we going to curb the way hundreds of millions of people talk on the offhand chance that some lunatic’s reptile brain might get overly excited because he hears the words “crosshairs” and “crossfire” too often? It’s ridiculous, it’s not compatible with the First Amendment, and it’s not going to happen.